The importance of an accurate, instant 2-way translation tool is reflected in the sheer numbers of limited-English students as well as the magnitude of languages spoken today in U.S. public schools. According to facethefactsusa.org and reports from the U.S. Department of Education, National Center for Education Statistics, as of 2013, ten percent of U.S. public school students struggle with the English language (see Figure 1). This does not capture the higher rate of families / parents at home that struggle even more with the English language. The average number of languages spoken within urban school districts across the U.S. varies greatly, but it’s certainly a high enough number to require districts to employ on-call translation services. In NYC schools, it is estimated that over 800 different languages are spoken, and across the nation this varies by state and area. With this many students and families in need of translation and this many languages spoken, it is close to impossible for teachers, schools, and districts to provide equal opportunities for involvement and conversation to all students and families. Even if information is translated, it often turns into single direction communication. Families have no way to respond or ask questions in their native language, There is no opportunity for these families to become to truly engaged and have conversation with the school. For many school districts, the best they can currently do to handle multi-language translation is to contract with an on-call translation services firm. The typical on-call translation service provides for a one-way communication with, at best, a 24-hour turnaround time. Even worse, this type of service is prohibitively expensive for our public schools. Recently, we heard the story of an ELL student who was mentally unstable and in need of immediate family support. It was critical that their parents or family members be immediately alerted yet no one on site spoke the needed language. The only option for the school district was to submit a request to a translation service in order to send the parents the needed message. Minutes truly mattered in this potentially tragic situation. It was an unbearable burden for administrators to shoulder. With technology advances, there’s no reason for teachers and schools to bear such a feeling of helplessness. As our school communities strive for higher levels of parent engagement, it is critical that we look for options that allow for easy and instant translation in both directions. It’s time to give all students and families a voice. Imagine what our school communities will look like in 1 year, 5 years, 10 years, and even further in the future if we begin engaging all families with the translation technologies available today. Parents & Schools Love LivingTree! Who wouldn’t love a private collaboration network to connect everyone? LivingTree gives parents, teachers and schools one place on web or mobile to easily manage all activities! And folks, it also translates in over 40 languages too. This thing really fixes so many issues for everyone. With LivingTree, schools and districts can share targeted and relevant posts of timely information, plus receive and share via mobile as well. All parents are included in the conversation with translation into over 40 languages on web and mobile alike. Even beyond sharing and conversing, LivingTree enables simple volunteer management in the same private and secure place! Opportunities are instantly available to everyone and even include reminders for those who volunteer. Listen to what LivingTree users have to say about why and how it works, including Lesley Weaver, Irving ISD’s Director of Communication. Hear from parents, a student, and even LivingTree’s President (who is a seriously busy mom herself with a quickly expanding high-tech company to run!) on why LivingTree is the best way for school districts to communicate. Spring Break can be a fabulous time to travel and see new things, to refresh and rejuvenate, experience new things at home, or even get ahead for the coming months. These four ideas really resonated as ways to get the most from a Spring Break Staycation. Recreation is one of the best ways to make new memories, recover from stress, and feed creative thinking and growth mindsets. Whether it’s bicycling, jump roping, swimming, running, skating, playing tag or getting really creative with a water balloon war or even making your own field day plan, go out and play. Think how good it would feel to for them to get ahead on the summer job search and find something seriously fun to work at or an inspiring place to intern. The truly fun jobs and internship spots will be taken up first, and March is the time that many employers begin searching for candidates to fill positions. Get ahead of the rush and grab your seat in the “fun section”! #3 Do Volunteer Work and Make Someone’s Day! When you help someone it pays you and those around you in kind. Volunteer work is the best cure for being sad about missing out on the expensive vacation the neighbors got to take. Making someone else’s day is priceless and feeds the heart and mind. Whether it’s helping the elderly neighbors with yard work or joining in on a Habitat for Humanity project, any form of volunteer work that interests you or your children is sure to bring smiles as well as great lessons and stories. It is absolutely true that a clear house lends to a clear mind. Prepare to more fully enjoy the weeks ahead by organizing. The more organized you are in your closet, kitchen, supplies and files, the more successful you will be because every day life will just feel easier. Instead of rummaging around for whatever you need at every other moment, you can move through your day with ease and grace when you are organized. The entire household can breathe easier every day when you are and remain organized along the way. When parents ask kids about their school day, they often get a generic, succinct response. Tired of being left in the dark as parents, Cullen Childress and Krishna Sai founded LivingTree, a private, secure and hierarchical social network that enables convenient communication among parents, teachers, students, schools, districts and community organizations. Carswell said the LivingTree team identified the following communication roadblocks: basic websites, lack of mobile presence, paper flyers and emails where everyone replies to all. LivingTree’s mobile and web apps eliminate those outdated methods — and does much more. Instead of just wondering about the absence of Web 2.0 technology and social media, LivingTree took matters into their own hands. They built a network that allows two-way conversation. It is built hierarchically, like an organization. Each grouping receives relevant information, and everyone part of a group — a class, for example — can converse. So far, so good. 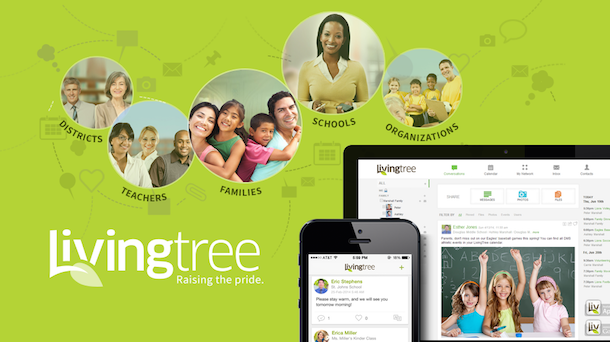 After being founded in 2012, LivingTree launched beta testing in Texas during the 2012-2013 school year. Now districts around the world — from Texas, Maryland and New York to Australia and Switzerland — use LivingTree, resulting in a user base of more than 200,000 people. Teachers share pictures from the day. They post homework assignments, request chaperones and remind users about field trip permission slips and report cards. Carswell said teachers can share information with students, parents or both groups. She said parents can view but not interact with information shared with only students. Parents can see how students communicate digitally and help them improve. The benefits of LivingTree extend to schools, districts and community organizations. For example, schools easily send weather alerts or announcements about school achievements, be them academic, artistic or athletic. Districts send push notifications to their schools. Community organizations — such as little league teams — spread information on LivingTree. Furthermore, LivingTree provides engagement analytics to schools and districts, allowing them to properly monitor their networks, a valuable feature especially in Texas, where Carswell said schools must conduct a self-assessment on community engagement each summer. Because of the analytics, and because LivingTree essentially sets up an entire network for schools and districts, LivingTree charges those parties a license fee that varies based on a district’s student count. LivingTree also makes revenue via training, Carswell said. The network is free for students, parents and teachers. Just because it’s free, however, doesn’t mean LivingTree is unsafe. In truth, LivingTree distinguishes itself through security, Carswell said. LivingTree integrates with a district’s student information system, and if someone is not in that system, they’re not connected. In addition, users must be invited via email to join a group. LivingTree’s invite-only and district data-based model eliminates that threat, a trait that surely contributes to LivingTree’s rapid growth. Since beta testing, LivingTree has experienced 9x growth each school year. Carswell hopes to have 15x growth from today by year end. Though she said that goal is lofty, Carswell believes LivingTree is equipped to achieve it, backed by a quality product, an angel investor who has contributed two undisclosed rounds, and 22 dedicated team members.